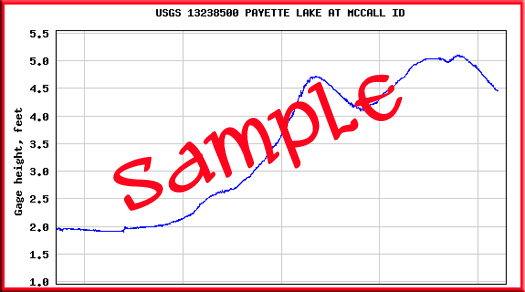 Click image above for current water height readings at Payette Lake. May Marina is located on Lake Street in downtown McCall. Slips are leased by the season, with a season running from the third weekend in May to the second weekend in October. There are 90 slips in all, with 42 reserved for sailboats. Amenities include a dock slip, private bathrooms with showers, an ice machine, and garbage pickup. The services are available to anyone leasing a slip in the marina. Slips are assigned on a first come, first served basis. We can accommodate sailboats up to 26' and powerboats up to 22', depending on width. Those interested in a marina slip may contact the marina manager at 630-4412 and be put on the waiting list. Major storage reservoirs in the Boise and Payette River basins from the US Bureau of Reclamation. Cascade Lake boat ramp information from the US Bureau of Reclamation. Cascade Lake water levels from the US Bureau of Reclamation.